Set in the heart of Snowdonia the world’s toughest triathlon is about to be taken on by UoN Tri. With athletes covering both Ironman and Double Ironman distances, its set to be a tough and challenging event. I recently caught up with each of the 5 UoN Tri team members heading to the hills, to ask them a few key questions. A triathlon for the committed. Exams were pushed to the back of these students’ minds as they once again became full time athletes for the day. “I’ll do revision on the way back” was a phrase frequently echoed along the way. However, today was not for revision; later exhibited by Kathryn Hewitt making a welcome appearance on the uontri snapchat. 20 of us got our scouse on and made an early start to Southport (definitely not Stockport). The swim was 1500m, 2 laps around an island but in a fluid that cannot be described as water; the floor of the lake, I struggle to describe at all. Once we had squelched our ways to the start line, the mass start began; men first, ladies 5 minutes later. With arms flailing and legs kicking it came as no surprise as I witnessed Jacob Dukes (2:24:01) take a hit to the face; especially since it was me who threw the accidental blow. However, a good swim still saw him out of the water before me. As we got out of the swim, the race began to heat up. However, for Adrien Fauvarque, it wasn’t quite hot enough, taking an early exit from the race; in all fairness, it was pretty cold. For the rest, it was onto the bike. 2 very flat laps along the Mersey coast with tight turns at either end. As Notts flew around the course, it was time for Notts’ number one fan to find her voice. One girl, one megaphone and one arm, Emily Walton; she didn’t disappoint. Much cheering occurred on the actual course as well, as the lap consisted of one straight road. Notts were flying into T2. 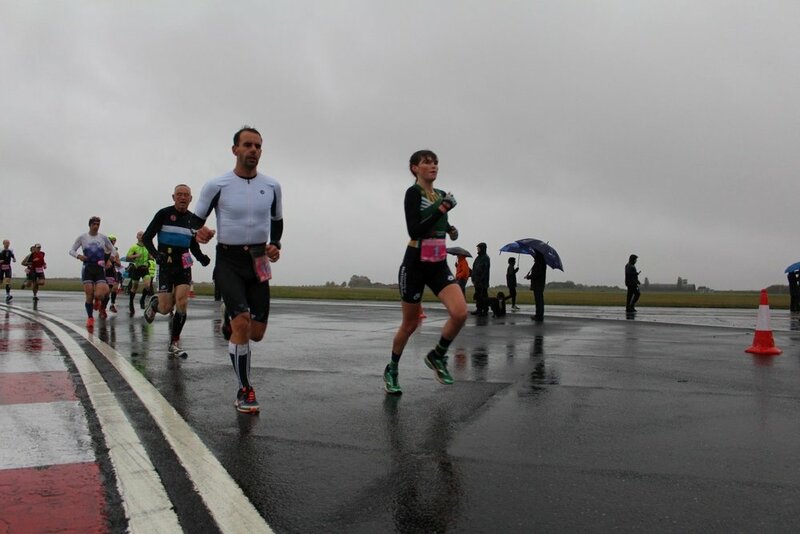 Adam Thorpe (2:08:06) decided to flex his calves off the coach as the 10km 2 lap run got under way. A tasty 33:52 saw him at 13th place overall in the final discipline. Notably, after having run a 65km race just the week before, any normal person would spend next weekend tucked up in bed, but ex-duathlete Zach Jennings (2:26:48) is anything but normal, finishing with a great run and a nice dip in the sea. Unfortunately, it was not to be for an injury ridden Adam Ford. After claiming the swim, the bike and 6km of the run, he had to pull out. At least a free t-shirt, some goodies and a great big medal (well-deserved) proved the journey was not a wasted one. Great big cheers ended BUCS 16/17 as Charlotte Cooper (3:37:28) ended with a fantastic sprint finish to receive not just the usual goodies, but a bulging bag of cakes and treats that were kindly handed around the coach on the return journey. What else are parents for eh? 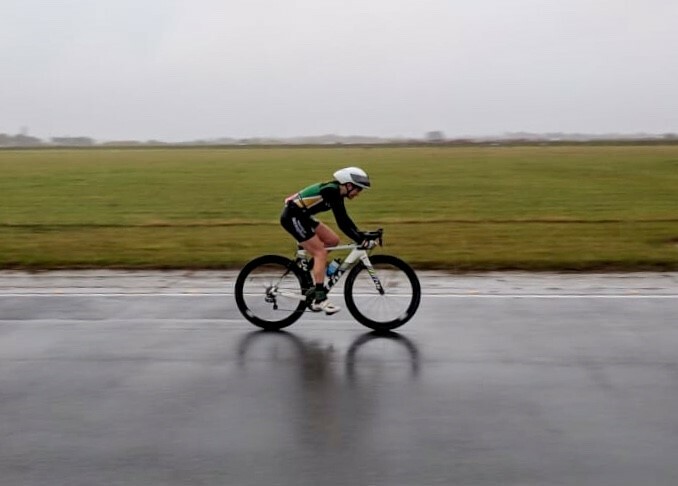 There was a top ten finisher for Notts in the form of Niall Rennie (2:05:44), taking 5th place overall in T2; Nialled it; ending up in 33rd place overall. The only 2 ahead for Notts were James “The Hark Attack” Harkin (2:05:14) 31st overall, with a stunning bike leg, and a shoddily shaved Sam Broomhead (2:03:54) 26th overall, with a fantastic swim. For the ladies, it was no surprise that Rosa “Smashed it” Lavelle-Hill (2:27:30) would come top for Notts, extremely confident for an overall win at 4am in the morning; lack of sleep is a dangerous thing. However, at 21st overall, and 18th on both the bike and the run amongst the ladies, she won’t be disappointed. Kathryn “Wooo” Hewitt (2:29:43) was the next for Notts with an amazing swim time just outside of the ladies’ top 10, ending up in 27th place overall. Making up the podium was Dervla “The Iron Lady” Ireland (2:37:00), an impressive bike time placing her 40th overall. However, she was more excited that the free t-shirts this year were orange. An incredibly successful trip saw the club earn BUCS points in both the men’s and women’s team races; placing 5th and 8th respectively (on what I can see from the results)!!! Ending the BUCS calendar on a massive high with great performances from everyone made a great day and a welcome revision break! Hope to see you all next year for more! Peter (2:15:56), I will get you one day! A big welcome back for 2017! 2017 promises to be an exciting year for the University of Nottingham Triathlon Club! Ahead of our acclaimed Notts Triathlon on campus, we are running 2 GoTri events to get you in the mood. These events are low key, and perfect for people who have never raced a multi-sport event before. They are also a great opportunity to practice transition in a stress-free environment! We have an Aquathlon on Monday 13th February 2017 7.30pm on University Park, consisting of a 200m pool swim and 3.4km run around campus. And a duathlon on Sutton Bonington Campus on Saturday the 4th March 2017 11.30am. Both events are open to everyone, and are only £5! We are also excited to announce that entries to Notts Triathlon (formerly Notts Varsity Tri) and the TriStars Aquathlon are now open! The event, on Sunday 2nd April 2017, is re-vamped for 2017, making it more accessible than ever for people to take part in their first triathlon! The final elite wave is also being extended to include additional university teams, promising plenty of rivalry... so make sure you stick around for that at the end! Very much looking forward to seeing both new and old members when training starts up again on the 16th January. There will be lots fun sessions planned by our coaches to help you through exams!